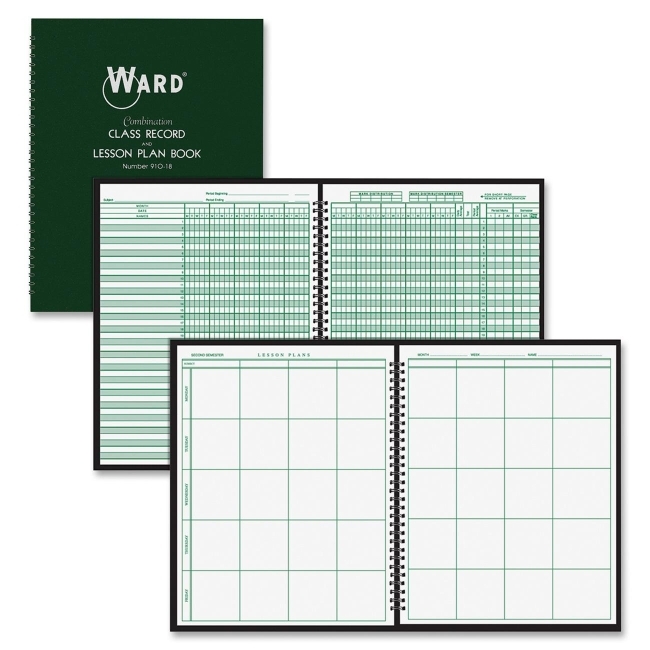 Ward Combo Teacher\'s Record/Planning Book - Wire Bound - 11\" x 11\"
Combination teacher's book includes a nine-week class record book and eight-period lesson plan book. Class record book helps you track grades for up to 38 students during nine-week grading period. Grading sheets cover four grading periods of nine weeks or 36 to 40 weeks of school and 16 classes per year. Class record portion also includes memorandum sheets and seating charts. Six-period lesson plan portion covers a school year up to 38 weeks. Each week is divided into a five-day week with eight periods per day. Lesson plan section also includes a two-year calendar, yearly schedule of school events, seating charts, and memorandum sheets. Letter-size pages are printed in green ink on quality white paper and bound in a durable, deep green cover with semi-concealed wire binding.